Greetings in the Name of the Lord. My dear friends, I bring you blessings as usual. Blessed is this hour. There is so much fear, shame and separateness in the human heart! We recognize it again and again. The fear and shame are often hidden away, so that the personality is not even aware of them any more and just suffers vaguely in a continuous, gnawing pain. How sad it is to observe this, particularly because it is unnecessary. It is but a phantom, my friends. The fear and shame you are so busily hiding have no reality, and yet spoil the life you could enjoy and could use for building up your spiritual strength. I am continuing this series about the images in the human soul, for there is no person who does not have them. Such inner impressions are formed in young years, and from those impressions wrong conclusions were drawn. These very images are responsible for your suffering, for the phantoms you carry about decade after decade, and often incarnation after incarnation. You all strive for the light of God, for liberation from your chains. But how many, many, people seek this liberation by outer means such as intellectual knowledge, or by outer events, whereby it cannot possibly be achieved. The only way you can reach the freedom that you strive for is to delve into yourself. In that way you will go through a tunnel of darkness and emerge on the other side to encounter the light of true independence. Only after you have recognized your own responsibility for the darkness while passing through the tunnel—which is not an easy experience—will you have truly gained real independence. So do not seek this liberation outwardly. It is of no avail. If you have not yet found and dissolved your images you are ensnarled by them. You are constantly reenacting the drama of your own errors and wrong conclusions. You are caught in them unawares, and you repeat and repeat and repeat throughout your life, and, as I said, often through many lifetimes, what your own wrong conclusions are leading you to and actually drawing toward you. I cannot emphasize strongly enough for all my friends who have not yet really started on this search that it is worth while. This self-search is the only thing in life that matters and that will bring relief. I would like to advise all those who have not yet had such an experience to talk to those friends of mine who have already had some success in their endeavors, and whom I congratulate. For nothing can prove better what this search is all about than the experience of those who are already on the way. You may be hesitant about starting because you do not know how to go about it. You may even lack the courage to ask for advice and help. Therefore it may be wise to start by discussing this with the very friends you know so well and who have already been quite successful in this endeavor. Those who search for their images cannot help but go through confusions and upheavals for a while and encounter reluctance and resistance. But these are the very causes you have planted within yourself, and you cannot eliminate such points of suffering unless you go through them and understand their real meaning. You need to recognize the hidden significance of your erroneous defense mechanisms, no matter how much you may have consciously rationalized them. All the doubt and mistrust you have for others is in reality nothing but the distrust that you have for yourself. Remember that! Find out why you distrust yourself. You will find at the root that you do not live up to your own standards and you cannot accept this fact. So the first step must be simply to accept yourself as you happen to be at this time. I know I have said this often, but you will find it necessary to apply this truth again and again on new levels of your being. If you search successfully, you will encounter within yourself the trend of wanting to be more than you are, and that is why you feel insecure. And that is also why you doubt others. Unconsciously you reason: “Since I am not true to myself by wanting to appear better and greater, I am not trustworthy. Others probably are the same.” One always judges others according to oneself, even if this self-knowledge is not conscious. If you can truly find this inner reasoning, if you let it come out into the open, so that you can experience the entire reasoning process consciously, it will give you a great clarification. It is not enough to think that this is probably what is going on within yourself because it makes sense. It is absolutely necessary that you discover and experience this reasoning and how it works personally in your case; what it applies to; in what way you react in exactly that way. Needless to say that at first you will be reluctant to discover this within yourself. It seems much easier and more pleasant to resist and rather distrust others, and to justify your distrust with rationally well-founded arguments. But once you have overcome the resistance for the sake of truth, in the spirit of the real truth-seeker by asking: “What is actually going on in me?” then you will feel the relief and freedom that only facing one’s own truth can bring no matter how unpleasant it may at first appear, no matter how unflattering in itself it is. The self-respect you must be lacking as long as your self-contempt is hidden will automatically vanish, at least to some degree, even before you have changed your inner attitude, by the mere fact that you had the courage to face the truth within yourself. There are many factors that are important to understand, and tonight I will discuss a few more concerning images and the search for them. Often you do not understand what made you retain an impression upon which you formed a wrong conclusion. Your mind has grown up, has changed by what you have learned from your surroundings and from life. Yet, while your image is alive, you have not changed. At one time in your childhood you had a shock. When you think of a shock, you think of a sudden experience with a very strong and unexpected impact, like an accident. But a shock may also happen, particularly to a child, in a more gradual discovery that things are contrary to one’s dearest and most cherished expectations. For example, a child lives with the idea that its parents are perfect and omnipotent. When the realization dawns upon the child that this is not so, it comes as a shock, although the realization may often come by a series of events until the new discovery makes its lasting impression. When a child finds out that what it used to believe about its parents, or the world as such, is not true, it loses its security. It is frightened. The child does not like what it finds and therefore will push this unpleasant knowledge into the unconscious and, because it feels guilty, will also build defenses against what it considers a threat. Whether it happened suddenly or in a slow realization, this threat is the shock referred to. You all know that shock causes numbness. Your body, as well as your nerves and your mind, become numb, even to the extent that you lose consciousness temporarily or have other symptoms. Thus the child will experience a shock because parents, the world, or life, are not the way the child thought them to be. Although the impression that created the shock may or may not be objectively correct, still, the deduction the child is capable of making must be wrong. Because children tend to generalize, they disregard all other alternatives and project their conclusions onto all other situations. A child’s parents are its world, its universe, therefore what the child concludes after the shock must be applied to everyone else, to life in general. This is the wrong conclusion that creates the image. The image was created when the orderly world and concepts of the child were destroyed. The wrong conclusions derive, first, from the generalization. The reality is that not all people have the same shortcomings as the parents; not all conditions of life are similar to those the child discovered in its own surroundings. Second, the defense mechanism the child chooses with a limited understanding of the world is wrong as such; it is even more so when applied to people and situations other than those in the early surroundings. This, my friends, is the way images are created. But you will not remember offhand your emotions, your reactions, your inner intentions, and your conclusions. You cannot remember them because you felt the need to hide this whole procedure for its lack of rational logic, and also because you were ashamed that your parents were not what you thought they should be. In your child’s mind you assumed that your case was singular. Everyone else had perfect parents, perfect home conditions, and only you alone experienced this shocking uniqueness that had to be hidden from everyone, even from yourself, as well as, of course, from your parents or others close to you. The shame arose from the mistaken idea that your case was unique, and the whole thought and emotional process had to be hidden away because of the shame. When these processes remain hidden, part of your personality cannot grow up with the rest of your being. It could not change and adjust and learn. For only what is out in the light can grow. If a plant is left in the earth with its roots cut off, it cannot grow. It is the same with every emotional current or tendency. Therefore you should not be surprised when you discover that your image-conclusions conform not at all to your otherwise grown-up intelligence. The same process exists with animals. A dog, for example, may hear the same kind of noise every time before he receives food. After some time he will respond instantly, knowing that food is now coming. When he hears the noise, he will come to the place automatically. The dog has thus formed an image, in this case not from a shock but from repeated impressions, and drew a conclusion. Or, to use a different example: One dog is burned by a fire and gets hurt. Whenever he sees fire afterward, he will be frightened, particularly if he has been burned not only once, but several times. The image has formed that fire hurts, the conclusion made that all fire hurts. Another dog may experience fire only as something pleasant. When the fire is lit, he is with his master at the fireside. His master caresses him, has time to play with him. So this dog will not have a fire image. So you see that the same procedure works even with animals. Otherwise you could not train them. With a child it is similar. An infant or a very young child knows only the most primitive emotions. It knows what feels good or bad. It knows love and pleasure when its will is done. It knows hatred, resentment, and pain when its will is not done. It is as simple as that. Only much later in life does one learn to evaluate more objectively and not according to one’s own pain or pleasure. While your image lives, you continue the childish procedure because in that respect your mind remains childish, regardless of how much the rest of your personality has improved and learned. Your developed personality is capable of judging maturely on the intellectual level, and, in some instances where no image-currents obstruct your perception, even emotionally. But where this slow or sudden shock-impression has affected the soul, one does not assimilate the experience consciously, and therefore one’s mind remains childish. It remains in the state in which it was when the image-conclusions were formed and pushed into the unconscious. In many of my lectures, a long time before we started to discuss the images, I mentioned the term “emotional maturity.” Now you will understand better how it happens that a part of an otherwise mature being remains immature. Actually, this part continues to make the same deductions, emotionally and unconsciously, as the child had made, so long as the image is not lifted into consciousness. Thus is it possible that you discover conclusions and faulty reasoning within yourself that do not at all correspond to the rest of your person. You may find it shocking, at least for a while, to recognize the primitive way in which your inner emotional reasoning functions. Considered in the light of this explanation, you will know that part of you simply could not grow up because certain parts were left submerged in your unconscious; and you will not be surprised to find, still living within you, the child that has not assimilated what you otherwise learned. That is why images cannot be found unless one relives emotionally one’s childhood and penetrates the irrational layers of consciousness. Merely remembering is not enough. Without some procedure to make this possible, it is out of the question to find your images. That is why I have suggested certain techniques. You will find that your image-conclusions are logical in their own limited way. You may even be surprised about the reasoning faculty, faulty as it may be, that exists in your unconscious. It is the reasoning of the child living in you. This is the way you reasoned when you were perhaps ten years old or less. The tragic thing about the images is that they assume power. They will make you see and notice only certain things, connected with your image-conclusion, and in such a way that the image will be constantly supported and strengthened in later life. Your image-conclusions conflict with the grown-up desires and aims of your life, and thereby cause not only a painful discrepancy, but untold conflicts and problems with your conscious goals, as well as with the reality of life. This must be understandable to all, even if you do not believe that emotions and thoughts are forms, creating emotional magnetic fields that draw events, people, and experiences toward you. The more unconscious the emotions and the greater the complexity of thoughts, the more powerful they must be, because while unconscious they are out of your control and cannot be adjusted to reality. Thus they are inflexible and rigid. Therefore, your images and their conclusions must repeatedly bring you into situations you did not consciously ask for. But your image-conclusions necessitate them. It is very important, my friends, to understand all this. The rigidity, the unyielding nature of the images generates the following sequence of events: You want life to move according to your desires. When things do not happen as you wish, you kick and scream inside, like the baby you still are in that part of your being. This immaturity takes over wherever your image is affected. Mature beings know they can control life only by going with it, by not demanding that life follow their wishes, but following life by adjusting to it. Where you have your image, you do not adjust. You demand, and you throw a temper-tantrum inside when your demands are not met. These demands are made on very faulty premises. Therefore, you may get what you ask for, but you also get what is part of your unconscious demand. Being unconscious, you did not know of it. You want a certain thing, a way of life—whatever it may be—for its advantages, but you ignore—as the child ignored—that every advantage has a disadvantage. So when, with your insistent inner crying and demanding, you get the supposed advantage, you also get its disadvantage. You do not like the disadvantage you unconsciously asked for, and think that life has treated you unjustly. It is extremely important that you consider all this when you search for and discover your images. It will help you considerably, my friends. All this will be just words only as long as you do not go through the experience of image-finding. Once you get started, you will be able to use a lot of what I taught you constructively. It will give you a deeper, profounder understanding and will help you a step further. As I have said before, everyone who is getting close to nearing an image-recognition feels a profound shame. You do not feel shame because all of a sudden you discover something very wicked or hideous. No! You may be much more ashamed of something that is merely silly. When you formed this image, the reasoning that makes you ashamed now was in your childhood in accord with your capacity to reason and think. Only relatively is it silly. And you, intelligent human being that you are, find it difficult to reconcile yourself to the fact that such a “silly” reaction actually lives in you. You are now at the point when you recognize that this has been your faulty deduction, your wrong conclusion for years and years. Now you are quite embarrassed that this was part of your mind, below your consciousness, but still part of your mind, your reaction. It will make it easier for you to accept this if you consider that in this respect you remained a child because you left the entire reasoning process in the darkness of your unconscious. It will help also to realize that there is no one among all those you know who does not have his or her own images, and similar incongruities. If you conversed with a four to ten-year old child, you would not be surprised at such reasoning. Realize that and you will overcome your embarrassment. Consider that you are not the only one. However, most people do not realize this and keep their images covered. Therefore you certainly have a great advantage through self-awareness, knowing your own “stupidities,” while others do not know theirs. Yes, my friends, this sounds strong, but in the infant part of your soul, as compared with your conscious mind, you will discover childish stupidities. When you first search for your images, you will probably be more concerned with your inner conflicts and with the wrongness of the conclusions as such. You will review your reactions. You will reexperience the wrong emotions and compare them, in theory, with the right principles. And that is as it should be. But after you have thoroughly understood all this, much more work has to be done. You have to find out not only in what respect you have reenacted your images, going from one pattern to another, but you also should begin to evaluate everything that happened in your life; things that are apparently not at all your doing. They just happened from the “outside.” When you think of some of your life-experiences, asking “What could I possibly have had to do with that? I did not lift a finger to make it happen, it just came to me,” your everyday logic will agree. Yet, after you have found your images, you will see that every event, regardless of how out of your control it seemed, was called forth by yourself. At the first moment of discovery this may be shocking, but not necessarily. The first glimmer of recognition is often already a relief. Even if at the first moment the discovery seems preposterous and incredible, relief must always follow, for then you can clearly see the connection between your image and a happening that appeared to be random or coincidental. The moment you understand how you have directed your life, how you have caused events of which you seemed the victim, you will gain the certainty that you are not a drifting little boat tossed by the winds on a great stormy ocean. You will realize that there is no injustice, and that will make you strong and safe. You will become mature by the mere acknowledgement of the principle and the truth of self-responsibility as demonstrated in yourself. You will understand how your hitherto unconscious desires, trends, and attitudes have governed your life. But now that so much has become conscious, you will be able to control, govern, and direct your life in consciousness, and thus be the captain of your ship. In this way you will approach life with joy and strength, my dear ones. You will have a strong feeling of certainty. It will appear to you as if you had firm ground under your feet for the first time in your life. My dear friends, perhaps you have a few questions in connection with this subject, before we turn to other questions. QUESTION: How do images and complexes combine? ANSWER: A complex is a symptom, or an outcome of an image. A complex in its manifest form is a camouflage of its real content. For instance, someone may have an inferiority complex about his intelligence. This is manifest. This he thinks he knows. In reality he covers up a very different emotion of self-contempt; perhaps what I mentioned at the beginning of this lecture, that he knows he is not true to himself, that he wants to be more than he is. A complex, of course, is connected to an image. It is a part of it. It is a message that there is an image. You can easily recognize a complex, in others as in yourself. The image in your soul appears to us like a hardened form. The healthy soul where there is no image shows itself to us as a glowing form, and, like the universe, is continuously in motion. Everything is flexible and flowing. All divine forces that flow through the whole universe and also penetrate the human soul constantly flow in multicolored splendor, in harmony with the qualities, characteristics, and personal trends of the entity. But where an image exists, the forces of the human soul are hardened, constricted and twisted, and they remain rigid. Therefore all these healthy and beautiful strengths and forces of the universe that the soul needs for revival cannot penetrate, cannot enliven it. They have to flow around it and that creates a disharmony. You know that every quality is a healthy strength that mates with a corresponding strength in the universe, whereas every fault is a twisted strength. A complex too is a twisted strength, but twisted in a way other than a merely simple fault which is on the surface. It comes out of the image. Can you visualize what I am trying to explain? Perhaps one of my dear friends here who is an artist will be inspired to draw such an image form and around it, outside the image, paint the many-colored cosmic forces in beautiful, harmonious motion, and also show how they stagnate and congest where the hardened image exists. Out of the image come sharp and twisted forces, and these would be the complexes. QUESTION: You say images are a general fact, everybody has them. Why do we have to have them? Why does one have to have images? ANSWER: Everybody does have them, but you do not have to have them. You create them. ANSWER: No, not for development, but out of ignorance. From self-will and pride. Everything that the Fall has brought about. You chose it so. QUESTION: Did I understand that right: Any event about which we really can’t do anything was caused by our images? ANSWER: You understood correctly. Except when it is a question of the karma of a previous life. But the principle is exactly the same, inasmuch as you reap what you have sown. But you have sown it in a previous life and you reap it now. That may be the explanation of a one-time event that may not have anything to do with an image, in the exact sense. But, my friends, even in cases like that you will still find the root in your image. Because if a karma has not been paid off it must mean that the root is still within the self. If you had paid off the karma, you would not have the root anymore. You may find in yourself the same faults and trends that in a former life caused you to commit a graver action, one that you would no longer be capable of committing because of your development. Nevertheless, the same root must still be there, for otherwise you would not have that karma. You will be able to find it in the depth of your soul, and certainly enfolded in your image. QUESTION: This means that karma and images make a vicious circle? ANSWER: Of course. If you will reread the lecture I gave some time ago on birth, now that you have learned about the images you will understand how it works. You may remember that I explained that when the entity is prepared for life, certain problems are left closer to the surface in the fluidal body. And according to these problems, parents, country, and life-circumstances are chosen, so that you can become aware of the image and challenge it if you so choose. So, karma and images must work hand in hand. If you have certain experiences in your childhood, it is because you have certain parents, and a certain environment. This was most suitable for you, according to your entire incarnation-history, so as to bring out your problems for the purpose of your development and purification. You cannot purify, you cannot eliminate a problem or a fault if you do not first become aware of it. To become aware of it, something unpleasant must happen, otherwise you would never pay any attention to your inner disharmonies. Karma, as you all know, is nothing else but cause and effect. The same law works also within one lifespan. If in this present life you find your images and wrong conclusions, you will understand, see and experience in your own person the truth of the law of cause and effect clearly demonstrated. Thus you will know how karma works. It is the same principle, only more extended in time, over a span of several incarnations. QUESTION: If, for instance, somebody dies in a concentration camp, which is a karmic effect, how does that combine with the images? What kind of image would there be? ANSWER: Oh, my dear friend, there are millions of possibilities of images. I cannot possibly enumerate them all. 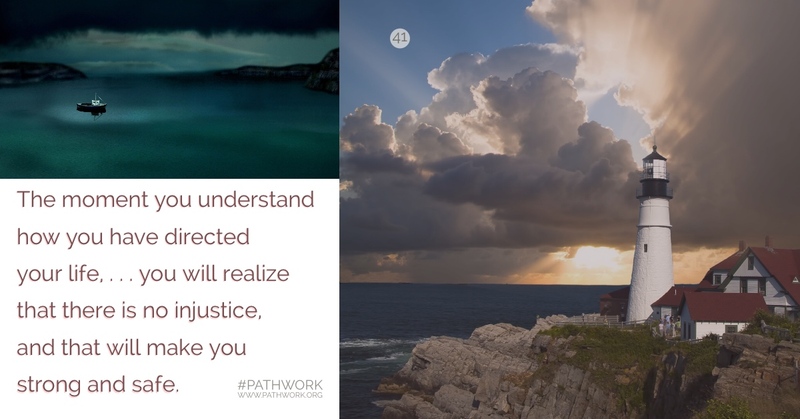 You will gain more understanding about these things by continuing the work you are doing, not only on yourself, but also by working with others. If you can translate the “milder cases” into stronger cases of law-violations, then you can imagine quite easily that a heavier karma is built on the same principle as in the cause and effect of image-conclusions. Both draw events built on wrong conclusions which are always violations of divine law and truth. It is only a question of degree. It does not make any difference if deviation from law and truth occurs out of ignorance and error or is committed willfully. The principle remains the same. But when a person deviates from divine law consciously, because his spiritual development is still so low, an image will not result. An image is the result of unconscious reasoning, deduction, and conclusion. A conscious, willful law-violation will draw outward effects, that which you call karmic results. An inner violation in the emotions, remaining hidden in the unconscious, will create an image and will have a different effect. Here the law-violation happened in a lesser degree, and in the unconscious. So the two alternatives we are discussing operate on the same principle, but they are not identical. If a criminal kills someone, this is not an unconscious act and you cannot speak about an image when he reaps the fruits of his action. But he may in the next incarnation wish to kill without doing so, suppressing his desires, keeping them, perhaps, as an imagined defense against the hurts of life, against the fact that his wishes are not fulfilled. This may then create an image. But you cannot say that every crime that is committed and every punishment for it is due to an image. The image comes from unconscious wrong reasonings and factors. It contains desires and conclusions that more primitive people act out in consciousness. QUESTION: What happens in a case like the death of the many children in Chicago who burned in a fire. When those little spirits come into the spirit world, is a death like this not a tremendous shock? ANSWER: Well, my dear, you know that children die and I have often discussed this. If it did create a shock in certain cases, then it was good for the entity. It had to go through it. And if it was not good for the entity to experience a shock, it would not have gone through it. You can be sure about that. QUESTION: How can a child spirit reason? ANSWER: Why not? Before it was incarnated, it was not a child spirit. It was a grown-up spirit and it voluntarily undertook a short life. Perhaps the spirit preferred to choose a violent, unpleasant death and get it over with quickly, so as to be reborn after a shorter span and then start on a higher level. You know that entities have their own free will and choice to a large degree. Others may prefer to do it more slowly. Whether an occurrence in a state of shock, for a child or a grown spirit, makes sense or not, the experience will be evaluated and assimilated afterward and whatever the entity experiences will be fruitful and not for nothing. Let us again take an example: A person is responsible for many cruel deaths, like in a concentration camp. Since this example was chosen before, we will use it again. This spirit is in the spirit world and sees he has debts to pay, he has much to learn. He may be given the choice to remain in the spirit world for two to three hundred years, by your earth time measurement. In this period, existence cannot be very pleasant for him. The sphere he has created for himself with his thought forms, the forms of his emotions, as well as with his deeds is a dark and dismal one. Afterward, an incarnation is waiting for him where certain possibilities exist, but they are again limited, due to what he has called forth. None of these possibilities can be too pleasant or easy. And then such an entity may ask: “Is there no other way to get this over with more quickly?” And then he may be told, “Yes, there may be ways. You can be reincarnated very soon, perhaps in ten, fifteen, twenty years, and while you help fulfill the fate of some parents who have to go through the hardship of losing a child, you yourself can pay off a great deal by enduring a violent and unpleasant death. Would you prefer that to the other alternatives you have and then start on a cleaner slate for your further development? And many a spirit desires this. This is only one possibility, there are many others. But you ought to know by now that there is no injustice and no coincidence. QUESTION: Disregarding the question of justice, doesn’t it appear as a strange coincidence that there should be wholesale slaughter of many individuals, like for instance in a concentration camp, and that such a large group is burned in a fire? Isn’t there some sort of wrong thinking or action there? ANSWER: There is no coincidence. You see, when you go back in history, you will see that there were always times when great cruelty existed and mass slaughter happened. After certain intervals it happened again, the next time caused perhaps by another group, another nation. You can be quite sure that in the following period the former torturers then became the victims. Because that is what they have drawn to themselves. I do not say that this applies to every individual case. There may be cases when the retribution, or effect of the cause set in motion, may be carried out in a different way in an individual fate. Then again, some victims may have undertaken a special task, voluntarily enduring more through one incident like this than they normally would have had to go through in the desire to develop faster, to overstep many levels in one sweep. But as a rule you can be sure that one mass-killing causes another, changing the roles from torturers to victims until all have learned their lesson. In some instances the paying off of such a debt does not happen in the succeeding incarnation, but several lives lie between cause and effect. You must not forget, you all went through periods of cruelty, some ten incarnations ago, some even less. If great disasters and accidents happen in which many people are killed, you can be sure that this is a measure taken by the spirit world where everything is executed in full justice and according to the often freely-chosen fate of the various entities involved. QUESTION: Do I understand that images can be either karmic or non-karmic? ANSWER: They must have a karmic origin, because if they would not have a karmic origin, they would not form an image in the first place. It would be something so much on the surface that you could very easily discover it. In the process of the image search, you will probably discover little reactions where the process of the mind operates on the same principle, only there you cannot talk about an image, because it is not something that is so important, or significant, or deep-rooted, or weighty. If it is of deep significance and causes conflicts, it must have karmic origins, but to think about it, what it may have been in a former life, will be to no avail, it will not lead you anywhere. But with the help of your own memory you can go back to its origin in this life, if you work in the right way. And that will be sufficient. If, in certain instances, the knowledge of previous lives is good and helpful for your development, then it will be given to you, one way or another, but only then. QUESTION: Is it possible at all, and if so, at what age, to lighten, to ease the formation of images in a child? ANSWER: Of course it is possible. If the parents would be on such a path, they would have to know what their own problems are, and thus what the child may absorb from them which would be image-material. In that way, they could to a large degree avoid the formation of an image by helping to draw it to the surface while the conclusions are being formed and are still accessible. The problem could then be treated right away in consciousness and when the child grows up, the conclusion will alter with the growing process. Furthermore, parents who are on such a path develop a sensitivity with which they can observe the reactions of the child. That would be the ideal case, but as yet it happens very rarely. QUESTION: Is there a test by which one can know what is one’s image? ANSWER: There is no test necessary, because when you have found your image, you will know to the core of your being that it is that way. The equation will come out right, in whatever way you look at it. It must come out even. But it may happen that an image-consciousness is approaching and yet the personality is so reluctant and so full of resistance that he or she cannot see it. Then all you have to do is to go on and on working from all sides, from all aspects, and all of a sudden the knowledge will be there. And then you will not need any confirmation, because you will just know this is it! All of a sudden your whole life will make sense. You will understand your life and your failures. You will understand yourself and therefore also other people around you. The riddle will be solved. The puzzle will be complete, with every piece falling in its place. So there is no test and no trick and no magic. So no confirmation is really necessary. For if you know your main image, everything will fall into place. And even before you can dissolve it, the mere knowledge of it will make you free. That feeling of freedom I mentioned may occasionally occur already before the main image has clearly come to the surface, by little but significant recognitions that are an integral part of the main image. When you have the little images, you may at times already experience this feeling of freedom, but how much more so when the picture has been completed! QUESTION: One of our group now here for the first time would like to know how to develop her psychic powers. ANSWER: I would like to ask this friend first, what is the purpose of it? QUESTIONER: To help children, the aged, and those in need. ANSWER: The motive is a good one. There is only one really good way for such a development, and that is the following: First give up thinking about it at all and concentrate on your own spiritual, mental, and emotional development and on your own path of purification. The more the unconscious has been explored and become conscious, the clearer the channel. I am speaking generally now and not just to you, for it applies to anyone desirous of helping in such a way. The development of psychic powers should always be secondary. It should be left to the will of God in what manner these powers will manifest. And the stronger they manifest, the greater the necessity for a stringent path of self-development! I cannot stress this enough. So if you can leave psychic powers aside for a while, in the wisdom that this is dangerous material unless self-awareness is present to a marked degree, and if you do so for the sake of God, then He may give it back to you a hundredfold when the time is ripe. If you learn to put aside your self-will and can say, and mean it: “Father, Thy will be done, let me be Thy instrument in any way Thou choosest, not the way I choose. I know that in order to be an instrument for Thy world, I have to go on this path and I am not shirking its hardships,” then you have the proper and healthy attitude that must be pleasing to God. That is the only way, everything else may even prove dangerous. Goodwill alone is not enough protection. Ignorance of many factors can bring a great deal of trouble and untruth. The unexplored unconscious plays a great role, particularly in this type of work. Self-awareness must be developed if psychic powers are not to prove dangerous. I am sorry that we could not get to the planned questions tonight. Please save them for next time. One more word, before I retire, to my dear and beloved friends on this path. I would like to ask you to help your brothers and sisters in Switzerland in the image-finding. Think about a way in which this could be done. I have already made a few suggestions, perhaps you can think of further ways. My dear ones, Christmas is approaching, and the Light of Christ is spreading all over and is also touching this earth sphere. Imbibe of this light, of this wonderful strength, so that you will find forever new stamina for this path of self-finding that is a joy to all of us. Receive the blessings of the Lord again. Be in peace. Be in God!